An investigation on judge Artur Yemelianov, deputy head of the High Economic Court of Ukraine. After divorcing his wife, she started to heavily invest in real estate, though she seemed to have no independent income. 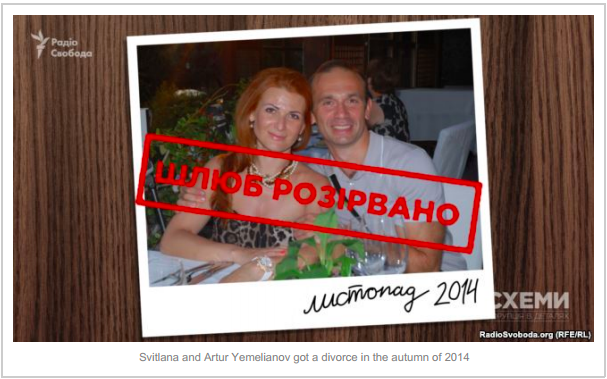 Evidence points to the divorce being a fake, aimed at hiding Yemelioanov's luxury assets. During the presidency of Viktor Yanukovych, judge Artur Yemelianov rocketed up the career ladder from deputy head of the Donetsk regional economic court to deputy head of the High Economic Court of Ukraine. He is still administering justice in spite of having been the subject of several journalist investigations on the large-scale raiding and corruption as well as criminal case investigation by the Prosecutor’s Office on unlawful interference with the operation of judicial bodies. The judge is a regular visitor at his ex-wife’s Svitlana in Vienna, where she lives with their children. After a chance encounter with this judge during one of such flights, journalists of the programme “Scheme” (joint project of the Radio Liberty and the TV channel “UA:Pershyi”) decided to take a closer look at the assets of his ex-wife Svitlana Yemelianova. What they discovered was elite property in various luxurious locations, such as hotels in Austria and Germany, fancy apartments in the Emirates, villa in Antalya. The burning question is how did she have the means to pay for all those assets? As for their 2014 divorce, which enabled judge Yemelianov to omit all the elite real estate from his public declaration, registered in his now ex-wife’s name, was it or was it not a sham? Now Artur Yemelianov is the judge of the High Economic Court of Ukraine. Even though the High Council of Justice suspended him from administering justice at the beginning 0f 2017 for being prosecuted in the criminal case. Not for long, only 3 months. Prosecutor’s General Office of Ukraine suspects him of unlawful interference with case distribution among judges. According to Serhiy Horbatiuk, chief of the Special Investigations department of the Prosecutor General’s Office, criminal proceeding against Yemelianov is close to completion. “The evidence and the necessary materials are being organized. I am not authorized to mention the exact date, as it will put pressure on the investigating officer and prosecutor. They are the ones to set the date. However, I believe that the case is on a fast track to being tried”. 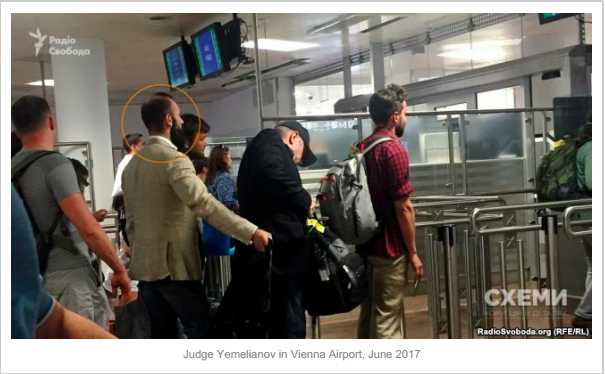 Judge Yemelianov has also been subject of the numerous journalistic investigations on raiding and corruption. In the Public Integrity Council they call him “the epitome of Yanukovych-time judicial system”. It was during his presidency that the judge’s career got on such fast track: he was promoted from deputy head of the Economic Court of Donetsk region to deputy head of the High Economic Court of Ukraine in Kyiv. Vitaliy Tytych, the Civil Integrity Council coordinator, is giving some highlights on how the system, designed by Yemelianov, was functioning: “It was the so-called “Donetsk Locomotive” (Ukrainian corruption term), when Yemelianov or negotiators would take orders from clients on the final decision of the court and guarantee prompt and painless proceeding from courts of first to last instance. Nevertheless, even now, being under investigation, he continues hearing cases and makes rulings in the name of Ukraine in the High Economical Court – the court that has the final say in all the property and business disputes. 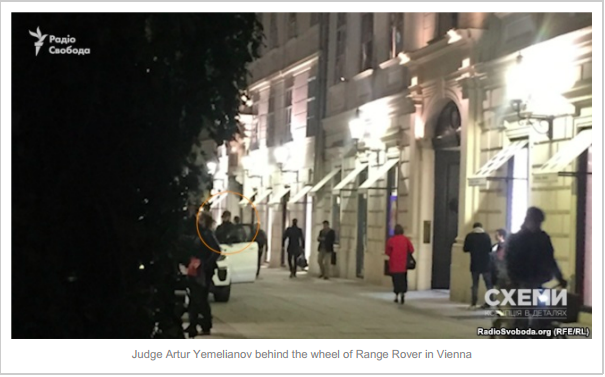 If judge Yemelianov was behind the numerous manufactured court decisions that he had to interfere with the judicial bodies to ensure (according to the prosecution), what personal gain did he have from all of that? In June of 2017 Natalka Sedletska, author and presenter of the program “Schemes”, during her trip to the editorial conference, accidentally recorded Artur Yemelianov in Vienna airport on the flight from Kyiv. At the time it was revealed, that through the secret court order he was able to reverse the previous order that prohibited him from leaving Ukraine and took a flight to the Austrian capital. What was so important for Yemelianov to make him go there? When looking for the answer to this question, the “Schemes” journalists went there themselves following the thread, which, unraveling, revealed the extensive geography of the elite property. This lead turned out to be Svitlana Yemelianova, now officially ex-wife of the judge and mother of his three children. Up until 2014, Svitlana Yemelianova was member of Donetsk City Council from the Party of Regions. After the Revolution of Dignity in the autumn of 2014, she and her husband got a divorce, after the law enforcement started looking into the judge’s affairs. 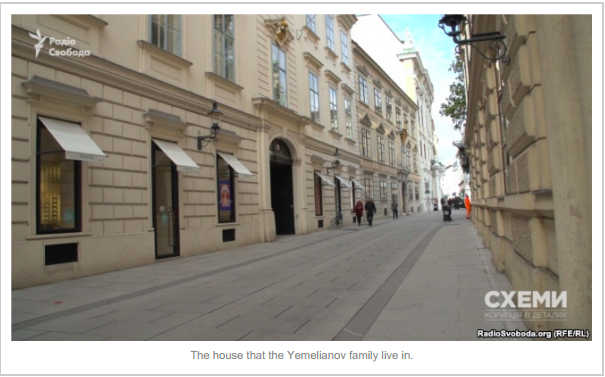 Ever since, Yemelianov is not formally obliged to declare the property registered in her name. Coincidentally, ever since, the number of his possessions took a plunge: for instance, the mention of 11 apartments, several houses and plots of land disappeared from his declaration. As for personal transport, he was left with nothing but a motor bike. However, this list of the judge family property is far from exhaustive, and now Yemelianov does not have to come up with explanation of where the money for this property came from. Since 2011, when judge Yemelianov’s career got on the fast track, his wife already had the small business in Donetsk – she was buying up elite real estate in Ukraine and abroad. She would go on doing just that even after divorce. As for the divorce, was it even a real one? Or nothing but means to hide numerous properties of a shady origin? In October of 2017, the filming crew of the program set off to Vienna. Just one block away from the drama theater Burgtheater there is street Herrengasse, literally meaning the “Street of Lords”. It’s one of the most expensive Vienna locations. Family of the High Economic Court of Ukraine judge Artur Yemelianov live here, in one of the ancient renovated mansions. The estate is rented for 3 years and the total rent will cost the judge’s family over 160,000 EUR – according to the lease agreement that the journalists managed to get access to. 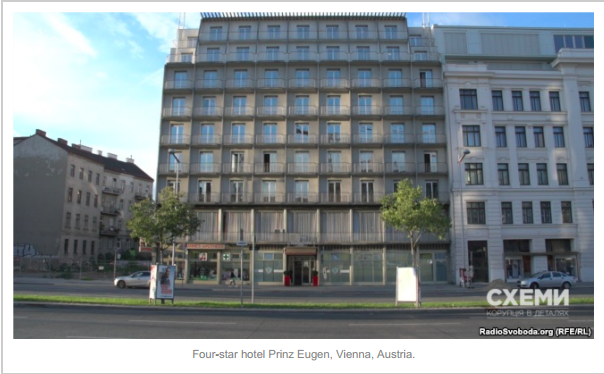 The four-star Vienna hotel Prinz Eugen. It is situated right opposite the main railway station of the Austrian capital, Hauptbahnhof. It is one of the two hotels that Svitlana Yemelianova co-owns. 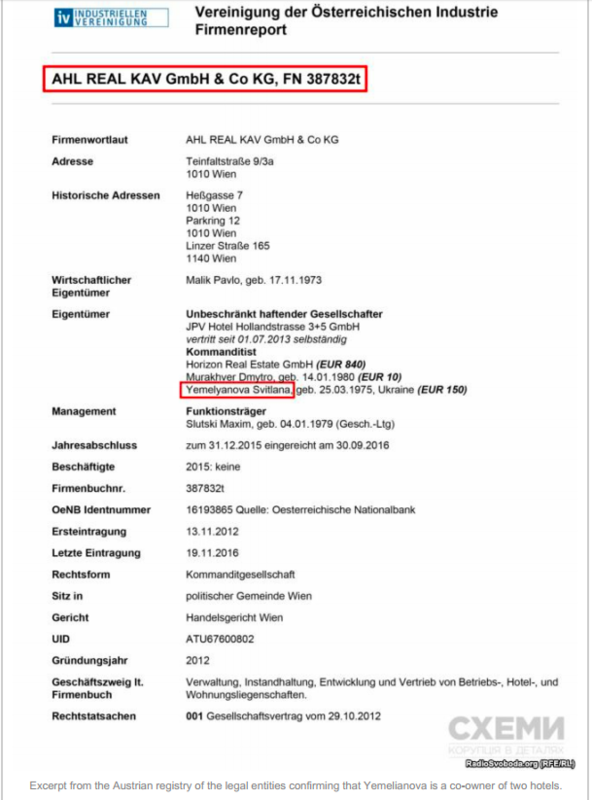 According to the official data of the land registry, the hotel and the land it stands on are registered to the Austrian firm AHL REAL PEU GmbH, that purchased the real estate in 2012. The property is estimated at 4.5 million EUR. What kind of firm is that? It was founded by the three Ukrainians of Donetsk origin, Dmytro Murakhver holds 1%, his brother Pavlo Malik holds another 85% (through another firm), and Svitlana Yemelianova holds the rest – 15 %. Ukrainian mass media often mention these three names in connection with occasional hostile takeovers of businesses, aided by the court decisions. Turns out, their Austrian business is another thing that connects them. estimated at 4.5 million EUR along with its land. It is situated close to the former summer residence of the Habsburg imperial dynasty – Schönbrunn Palace. Once again, according to the documents, Svitlana Yemelianova is the co-owner. 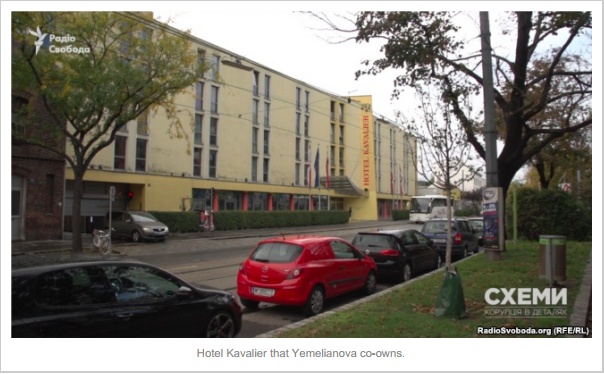 Both Prinz Eugen and Kavalier are part of the hotel operator Private Hotels chain, whose office the “Schemes” journalists decided to visit in order to talk to Svitlana Yemelianova. However, the filming crew was told that she was absent at the time and offered to leave their contact information so that they could pass it on to Svitlana. 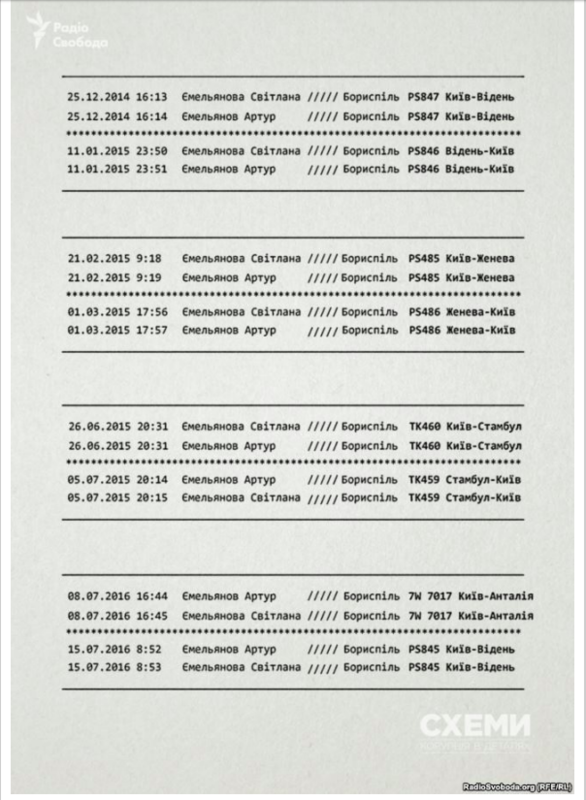 In addition, the journalists also sent their questions to Yemelianova’s email address. By the time the episode was aired and the article published, she did not contact the journalists. Judge’s ex-wife officially became shareholder of the both firms that own the Vienna hotels in April of 2014. At the time, they were still legally married. Thus, if not for the divorce, the judge would have to declare his wife’s Vienna hotel business in the next annual declaration. This would provoke inconvenient questions about the origin of funds to pay for the property. Svitlana Yemelianova purchased the Antalya mansion in the Seashell Belek Elite Villas complex, at the Mediterranean seaside, in 2011. 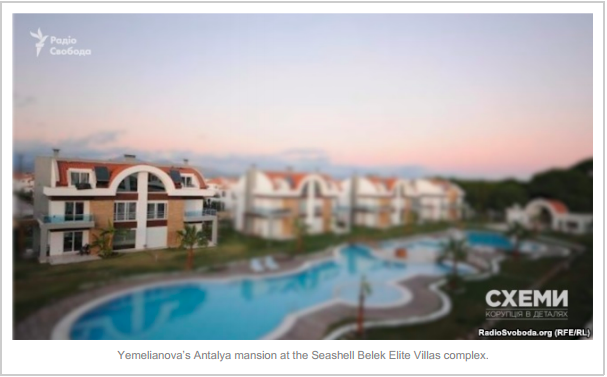 Investment in the Turkish real estate in the resort region of Belek totaled 350 thousand of the Turkish liras, or 250 thousand USD at the time. This information can be found in the registration documents for the villa that the “Schemes” journalists managed to access. It is highly unlikely that Svitlana Yemelianova alone would have enough funds to purchase a house in Antalya. That year, according to the Tax Administration data, she officially earned mere 40 thousand UAH. In the whole previous decade, she earned less than a third of the cost of the Turkish villa – about 650,000 UAH. As the judge’s career skyrocketed, his wife would proceed to purchase elite property abroad. For instance, in the summer of 2013, when Artur was already holding his position as the deputy head of the High Economic Court, Svitlana purchased real estate in the United Arab Emirates. Dubai. 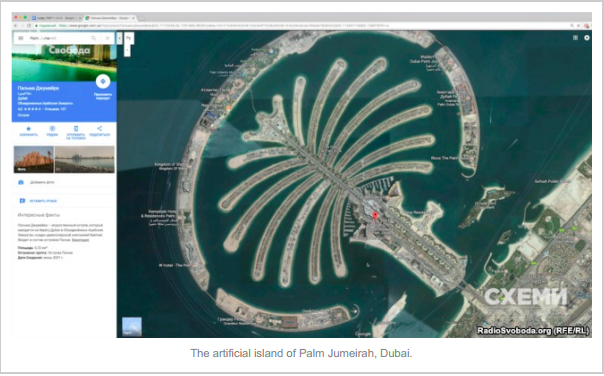 The famous artificial island of Palm Jumeirah. The northern wing of the Palm Jumeirah complex with panoramic views of the Arabian sea and the city. 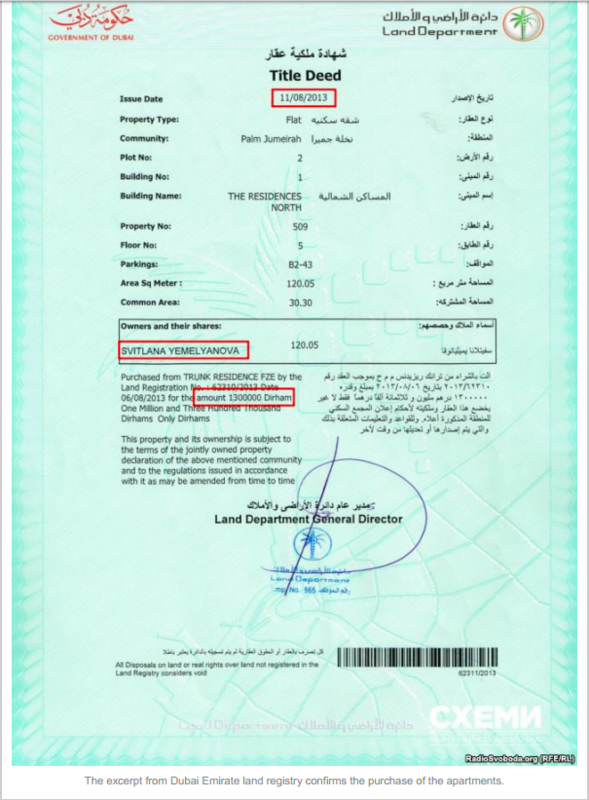 In this very location in August of 2013, 120 square-meter apartment became property of Svitlana Yemelianova from Ukraine, and the excerpt from the Emirate land registry confirms that. The price of the apartment is another piece of information that can be found in the excerpt, and it equals 1.3 million dirhams or over 350 thousand USD at the time. Still, the list goes on. 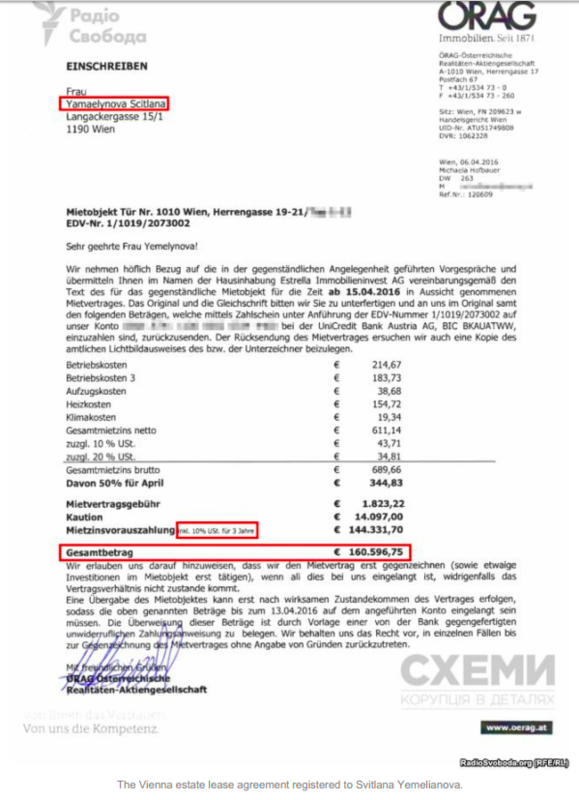 After their divorce with the judge was finalized, Svitlana became one of shareholders of the company that manages the hotel chain in Frankfurt-on-Mein. 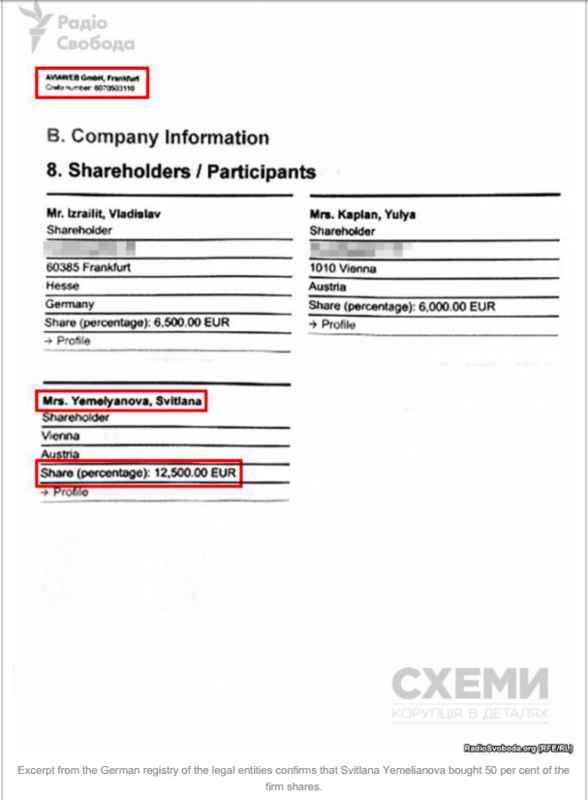 According to the official German registry of the legal entities, in February of 2016 Svitlana Yemelianova bought 50% shares of the German company AVIAWEB GmbH. 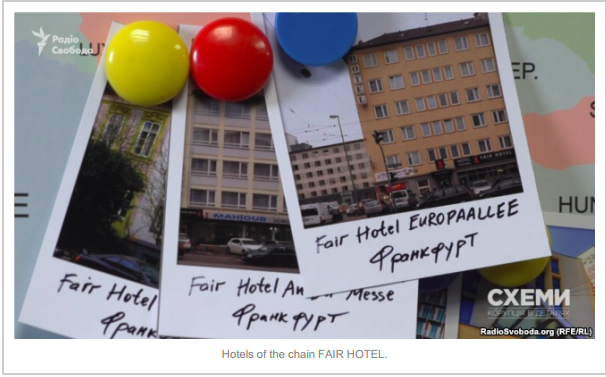 This German firm manages three Frankfurt hotels of the chain FAIR HOTEL: Fair Hotel Villa Diana, Fair Hotel an der Messe, Fair Hotel Europaallee. Villa in Antalya, luxury apartments in Dubai, hotel chains in Vienna and Frankfurt are just those estates and businesses abroad that the journalists were able to track down in the course of their investigation. 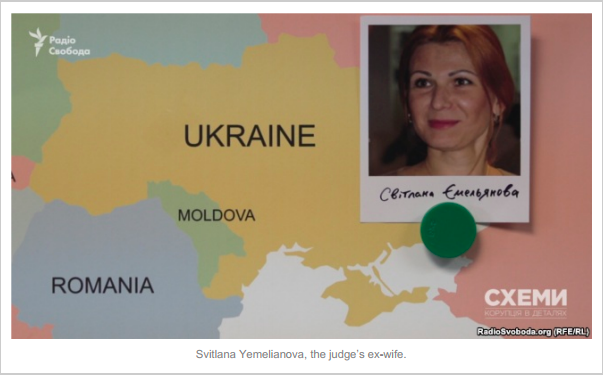 They were not intended to be revealed to Ukrainian citizens, as the judge divorced in 2014 and didn’t have to declare property, registered in Svitlana’s name ever since. “My wife and I got a divorce in 2014. After that, according to the declaration form requirements, I had to declare only the property that belongs to me and members of my family who live with me or have family relations with me”, – previously explained Artur Yemelianov in his comment for the “Schemes”. 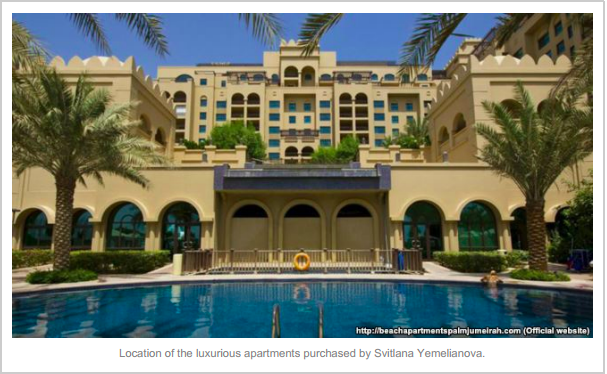 Most of Svitlana Yemelianova’s property, tracked down by the journalists, was purchased before and through 2014. While she was legally married with the Ukrainian judge. Where did the money for the property come from? According to Taxation Administration data, that the “Schemes” programme was able to obtain from their sources, her official income during 2001-2014 was just a little over 3 million UAH. Therefore, the suspicions of their divorce being a sham grew stronger. The “Schemes” started looking for the evidence that Svitlana and Artur Yemelianov continue living as a couple. They did not have to search for long. 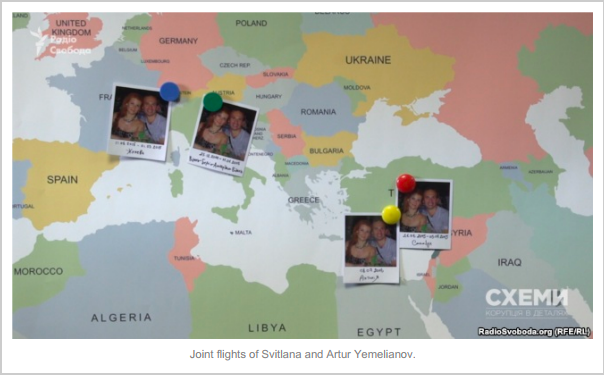 On December 25, 2014, just one month after the divorce Svitlana and Artur Yemelianov flew together for the New year holiday to Vienna from Boryspil airport. Their taking the same flight was noted in the database of border crossing, the programme’s own sources confirmed this as well. Moreover, the journalists managed to lay their hands on the whole itinerary of that trip: from Vienna the judge’s family took a car trip to Berlin, where they stayed in the famous five-star hotel Adlon Kempinski. It was where they celebrated the new 2015 year’s eve, then went to Amsterdam for a few days, returned to Vienna, from where they flew back to Kyiv on 11 January. This can be verified by the same border crossing database: Artur and Svitlana Yemelianova did take the same return flight on that day. As a single trip together one month after the divorce is not enough evidence to prove that the divorce was a sham, journalist walked an extra mile and analyzed the data on all the joint flights of the divorced couple up until now. One month after the aforementioned new year euro-tour, the couple flew together to Geneva, Switzerland, to celebrate Artur’s birthday. In a few months, they vacationed in Istanbul, from which they came back to Kyiv together, on the same flight. 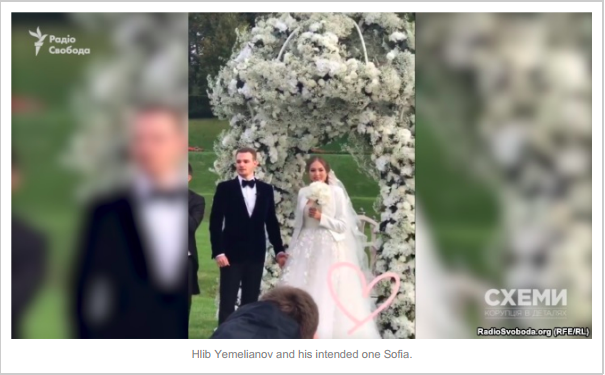 In the summer of 2016, Artur and Svitlana Yemelianova, having been legally divorced for one and a half year, took the same flight to Turkish Antalya. So, the journalists uncovered data of at least four shared vacations of the couple abroad. Therefore it was not surprising for them to see Artur himself near Svitlana’s house in Vienna on the very first evening they came to film the episode. October 5, 2017. Vienna, Austria. Herrengasse Street, where the officially divorced wife of the judge rents an apartment in an age-old house for more than 50 thousand EUR per year. 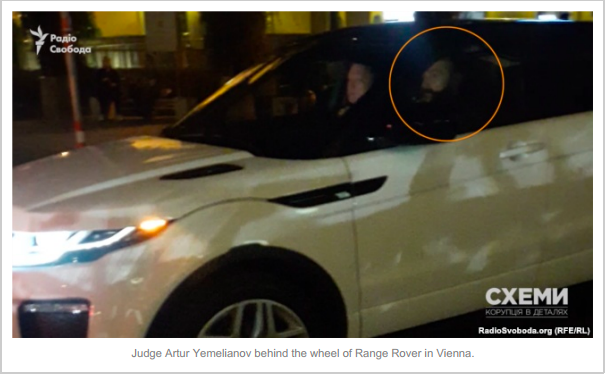 Here the filming crew spots Artur Yemelianov himself behind the wheel of a white Range Rover. The “Schemes” encounter the judge in the same location on the next day. He is unwilling to talk to Ukrainian journalists. Curtly offers that visits Vienna fairly often – every week. “I visited my daughter, you see, I came to see my daughter”, says the judge. He also says that this visit to Austria was special for him: “My son is getting married tomorrow. Wonderful occasion. So I came for my son’s wedding”. When asked about his wife’s business and where the money for the business came from, he offers to address these questions to Svitlana herself. Then he is quick to say his goodbyes: “You see, I am pressed for time today. On Monday or Tuesday I will be in Ukraine – then you can arrange everything. I’m willing to give an interview. You can prepare all the questions, I regularly stay in Kyiv. Now I must take care of my private life. When you are available, and I am available, feel free to contact me”. 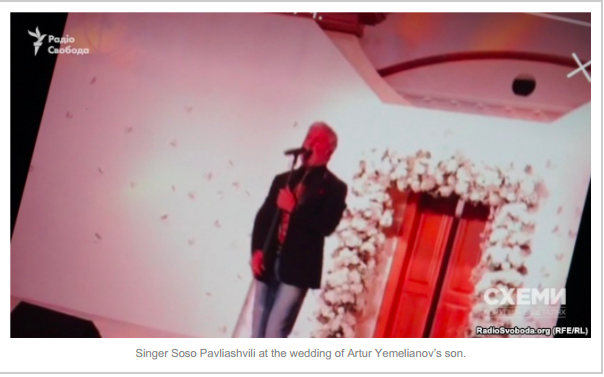 Hlib, son of judge Yemelianov, really had his wedding on the next day. The young man is 21, he studies in Switzerland in the prestigious private Glion Institute where they “prepare students for accelerated careers in hospitality business” and tourism. 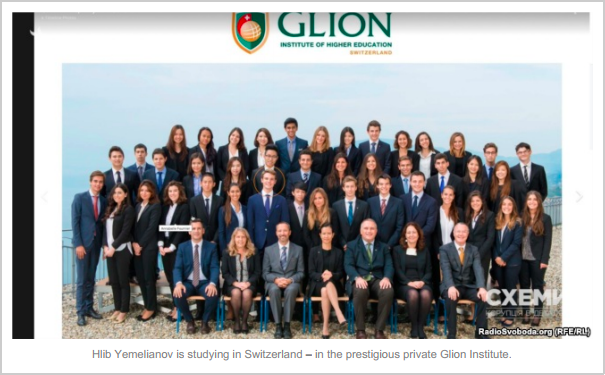 A year in Glion Institute costs about 40,000 USD. 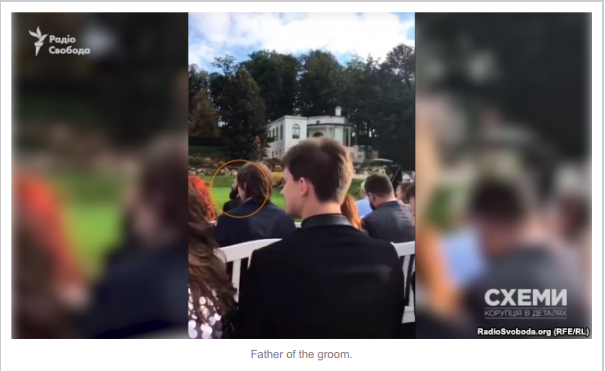 That is where the son of Ukrainian judge met his future wife Sofia from Russia. 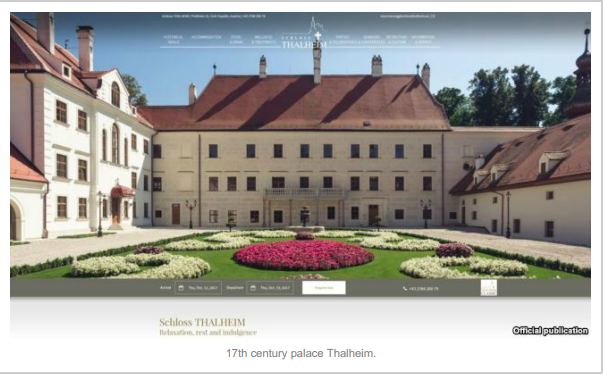 When in Vienna, the filming crew of the program found out that the wedding would be held in Thalheim Palace, one hour away from the center of Vienna. This palace with a gorgeous garden, built in the 17th century, still operates as a hotel and location for ceremonies and festive occasions. The territory turned out to be closed, however, the guests themselves provided a glimpse of the event when posting photos and videos on social media. Here is Artur Yemelianov himself, father of the groom. Russian singer of Georgian descent Soso Pavliashvili entertained the guests. 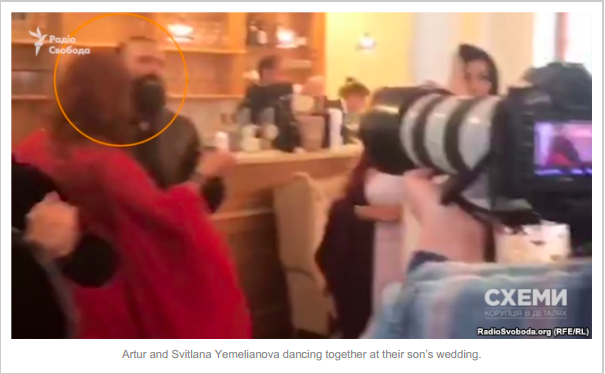 Here are groom’s parents Artur and Svitlana dancing together. Questions we have. Will there be answers? The whole range of elite real estate all over the world. Cars worth tens of thousands dollars. Children studying in expensive universities abroad. Son’s wedding ceremony in an age-old Austrian palace. Where is the money coming from to pay for all of that in the family of the Ukrainian judge? How real was his divorce from his wife, in whose name most of the aforementioned property is registered? Following the judge’s request, the editorial team sent all of the above questions to his work e-mail and to his personal messages, mentioning the date that the investigation episode would air and reminding of the promised interview. However, when faced with the specific questions, Artur Yemelianov refused to answer them after all before the foreseen date the program would air. What is more, threatening to sue, he demanded to put off the air until the time he would be able to comment on the aforementioned facts. “I insist on all information about me to be released only after I have had a chance to comment on them. Otherwise, it is a puff-piece fodder, paid for, and not an independent journalistic investigation. The legal consequences will ensue”, – he wrote to the Radio Liberty in the messenger. “Schemes” are publishing this investigation, as they sent the list of questions to judge Yemelianov well in advance and made all the conceivable efforts to give him the opportunity to offer his explanations before the air. Which he did not take. However, if the judge happens to be willing to give an interview after the release of this investigation, the editors will make sure it is published and shown in the future episodes.